To be eligible for respite care, call Resthaven now on 1300 13 66 33. We’ll facilitate your referral through My Aged Care. Alternatively, contact My Aged Care on 1800 200 422, or visit the My Aged Care website. After the assessment, you will receive a letter to let you know the outcome of your assessment. The letter will specify whether you have been approved for residential respite services. 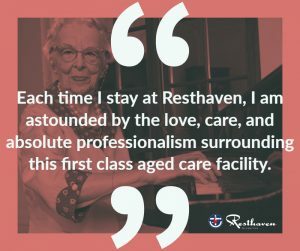 Contact Residential Admissions, quoting your My Aged Care referral number on (08) 8373 9113, or email accommodation@resthaven.asn.au. Please contact the Manager directly on (08) 8723 0911. Please contact the Manager directly on (08) 8554 2000. To use Resthaven’s Community Respite Services, you will need a referral from My Aged Care. Contact Resthaven’s Community Services on 1300 13 66 33, and we’ll facilitate your My Aged Care referral. Resthaven will contact you to talk about the services you need. Alternatively, contact Resthaven’s Community Services on 1800 13 66 33 and quote your My Aged Care referral number to book day respite. Interested in residential respite? Call (08) 8373 9175 today!